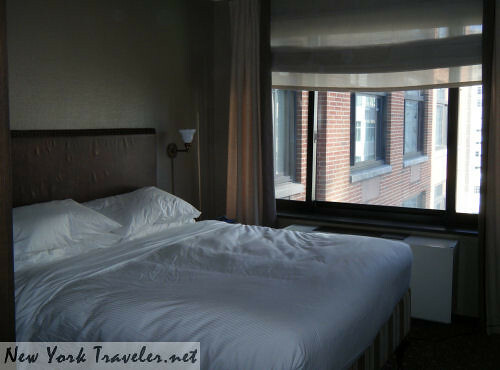 After a hectic day pounding the pavements in Manhattan, I prefer to sink into a quiet, cushy hotel room. I don’t want to hear the ruckus of neighboring customers, or room service bell boys scuffing their metal trays down the hall, or the buzzing whirr of the elevators. The Soho Grand Hotel on 310 West Broadway was perfect. It was quiet. It was cushy. The Soho is located in Manhattan’s trendiest neighborhood, intermingling with various row houses, studio lofts and apartments nearby. The hotel caters to the young professional with its straightlined chic appeal. The hotel is decorated in good taste, in neutral or natural colors with sparse whispers of utilitarianism about it. I was greeted at the door by a very young lady who handled my check-in well. The young people at the front desk seemed a little distracted, or perhaps they were so accustomed to guests who knew what to do and where to go that they overlooked my hesitation and need for guidance. The girl handed me a small package of tea soap and a brochure about room service and nodded at me that I could go now. A young doorman intervened and escorted me to the elevator and my room. All very perfunctory. The room is small. I had a room on the 7th floor, with a poor view. But hey- this is New York– few views are going to be rose gardens. The bed was incredibly cozy– I took that photo the next morning after I’d enjoyed a sound slumber in it. The pillows were feather, and the down comforter was clean and fresh. There’s a television and DVD player, but I couldn’t get it to work. Maybe I had to pay for it? Alas, I wasn’t interested in watching movies– the Soho Grand has free Internet service, so I wired up my netbook and was online quickly. Despite its smallness, the room was very quiet. I hear nothing of other guests, not even hallway doors opening. It was luscious. 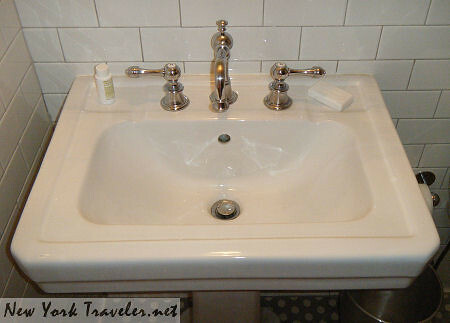 The bathrooms are very small but clean. I ordered room service that evening, not wishing to delve back onto the streets in search of food. The meal came very quickly and was tasty, but like all things in New York, it was very expensive: $50. I thoroughly enjoyed the quiet repose of the room after a busy day with advertisers, and slept soundly. 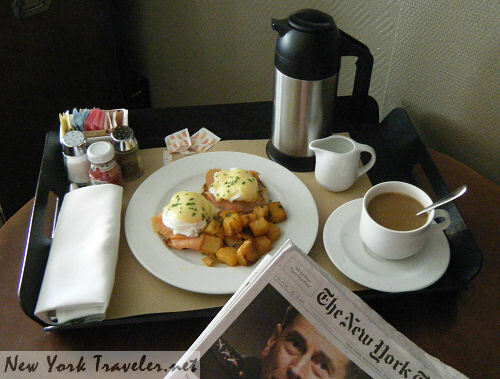 Next morning I ordered breakfast: eggs benedict and the complimentary New York Times. The meal was absolutely scrumptious (but expensive). Checkout was very easy. I left my keycard at the front desk and said my goodbyes. Nice and simple. This was a basic, one-night stay. Since it was just me and not the husband or kids, I was not as picky or attentive to details as I usually am. I didn’t take advantage of the luxurious, trendy dining room nor the various other hotel amenities available to me. In that respect, I don’t feel I got the full flavor of the Soho Grand. But I came to Manhattan needing a clean, quiet place to rest while I was preoccupied with other things. Soho Grand fit the bill. A basic Superior Queen guest room runs over $400 per night; larger suites are anywhere from $500 to $2000. 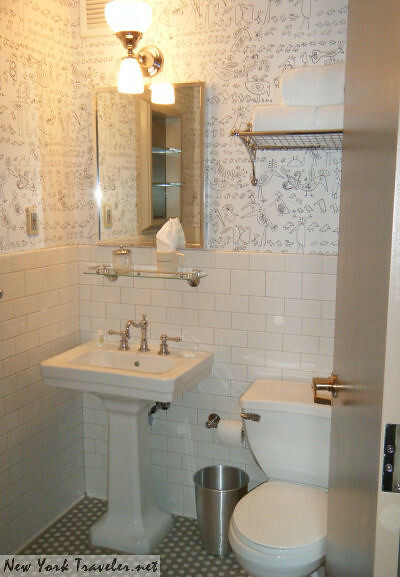 For a luxury hotel room in New York City, that’s not unreasonable.